Dave Grohl and co are the ultimate garage band - for real! 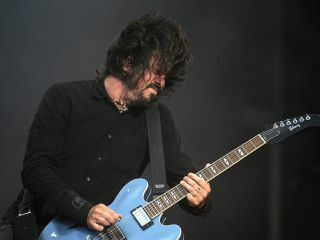 The latest Foo Fighters album, Wasting Light, was recorded in Dave Grohl's garage, and in keeping with that spirit, the band recently held a contest in which eight very lucky fans in eight North American cities won the ultimate house party: the Foo Fighters playing a full concert in their very own garages. As you can see in the video above, the band didn't treat the down-down gigs as a chance to play rock star. In New York, they spent quality time with a retired fire fighter who was injured during 9/11; in a Washington DC suburb, Grohl drove a fan's tractor; and in a couple of other cities, the band jammed with winners. The video ends, somewhat appropriately, in Seattle, where Grohl recounts his first Foo Fighters show, held in that town at a friend's loft. Telling the story about how he wanted to test the band out in front of friends in a party atmosphere, Grohl brings it back to the moment and says, "Honestly, that's just what doing shows like this is like."